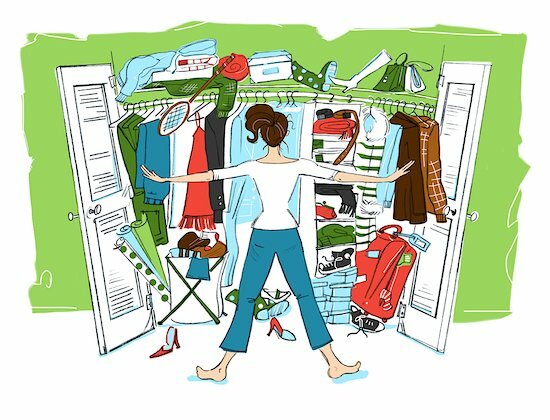 Think about your clothes closet–do any of these statements apply to you? You can’t find a favorite shirt. Many items don’t fit anymore. Your closet’s so cluttered you can’t close the door, or you drape items over a piece of furniture. That expensive closet system is no longer efficient, because there’s too much stuff. You know you should get rid of items that are out of fashion, but they bring up great memories. You hang on to rarely worn items, because they cost a lot of money. There are many items you don’t wear because they need mending. Take everything out of the closet and assess what is usable or “fits” now – (size, style, condition). Make three piles: Keep, Repair, Get Rid Of. Take action on all three piles within 24 hours: put Keep items back in the closet; either Repair items yourself or pay someone else do so; Get Rid of items no longer useful to you. Do some soul searching: What’s important to you? What chapter of your full life are you in right now? What brings joy? What things (or people) create hassle or frustration? With whom and how should you spend time? Take everything out of your Full Life closet: identify all the resources you “own”, for example skills, attitudes, aptitudes, behaviors, people, relationships and routines. Assess all the stuff in your personal closet against what’s important now? What should be Kept, Repaired or Gotten Rid Of? What are you doing that doesn’t “fit” now? What could or should you be doing, but don’t know how to get started? In what new things should you invest time and energy to gain skill, perspective, experience, satisfying relationships, better health? What “stuff” is no longer useful, and should be gotten rid of? Take action on the piles from your Full Life closet, and make sure you enlist the help of others to hold you accountable. A yearly Full Life closet cleaning allows for focus and intention on the things that matter, and opens up space for new opportunities and greater satisfaction. Try it–you’ll feel like you won the lottery!